We’d love your help. Let us know what’s wrong with this preview of Frida's Fiestas by Marie-Pierre Colle. To ask other readers questions about Frida's Fiestas, please sign up. Frida Kahlo is the most renowned Mexican female painter in the world. As evidenced by her paintings and by her personal style, she was totally dedicated to living Mexican, immersed in tradition. It is no surprise then that she was very attached to traditional Mexican food. 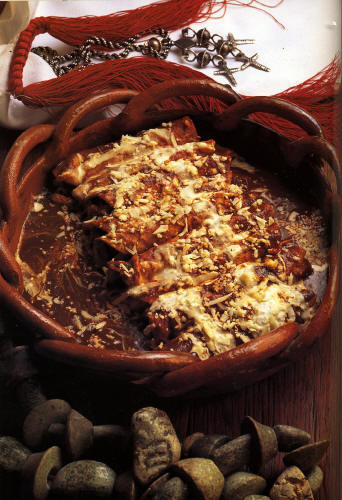 I am familiar with a fair portion of these recipes due to my interest in Mexican food and having read some about it, but there are still a few interesting recipes to find here. That said, I could rate this book based on the recipes, but I'm really evaluating it in light of my fascination with Frida Kahlo and how much more I love her for being so truly herself and demonstrating that through the food she consumed everyday. Co-written by Diego Rivera's daughter, Guadalupe Rivera, this book chronicles Frida's love for home, entertaining and cooking. 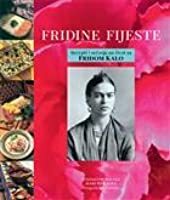 It contains the menus and several recipes of meals she prepared for many special occasions (including the menu for Diego and Frida's wedding feast! ), along with many photographs and journal entries. Though some of the ingredients are obscure, I plan to make an attempt at one of these menus in the near future. A beautiful book. It's been 5 years since I left Mexico and I'm also pregnant right now and hormones may play with my thoughts and feelings but, I honestly think is a really well done piece of work. Seriously, if you have the chance to read this book, DO SO 'cuz you wont regret it! I visited Frida's house in Mexico City in 1984. Changed my entire concept of home decoration for the better. I like this book for the stories of her life and for the authentic recipes of Mexico. I enjoyed reading this book if only for the insight into dinner parties that Frida Kahlo hosted. The recipes are not anything I would make but the hoots do seem to offer a glimpse of real Mexican cooking. Not sure I would cook anything from this book, but I did enjoy the portrait of Frida Kahlo's life (through food). Great pictures too. Just plain fun. A brief glance into the happy side of a family's life, and, for me, an introduction to Mexican traditional festivals. The pictures are beautiful, and I can't wait to try some of the recipes. "Her entrance caused a sensation. The extravagantly ornate Tehuana attire and pre-Hispanic jewelry caught the attention of the audience, and w Just plain fun. A brief glance into the happy side of a family's life, and, for me, an introduction to Mexican traditional festivals. The pictures are beautiful, and I can't wait to try some of the recipes. This is more than a “cookbook” well... I’m not so sure since this one was my first. It’s divided by the 12 months of the year, and at the beginning of each month a story about what was going on with Frida is being told by her stepdaughter, and that’s what gave the book a special touch. When it comes to the recipes, they were good. And take that from a vegetarian that’s going to change them a little bit and try them out as soon as possible. This is a gorgeous book. It is full of rich details, beautiful photographs, many recreating events described in the book, and an intimate look into the lives not just of the famous artist and her family and Friends but also a time and way of life that is mostly gone now. Each chapter focuses on a specific month and the special celebrations they held with the recipes for each dish included, a very nice touch. A wonderful celebration of Frida's love for cooking & entertaining shown in 12 different annual festivals/celebrations. Written by the daughter of Diego Rivera. 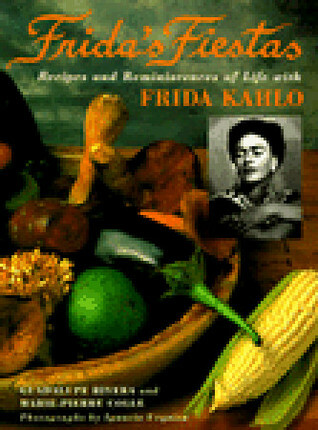 Contains authentic recipes from Frida's own collection. Loved the photos showing her kitchen & Blue House views. I've made several recipes from the bk & they're actually very simple to follow. 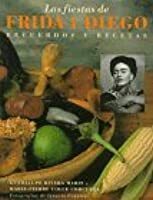 This is a fun collection of recipes, written by one of Diego's children, who spent her childhood with Frida. The recipes are really interesting and unique, and the stories and photos that go along are wonderful! Really great recipes. This is a book I think I should own for the food part. The writing is pretty romantic and whitewashed. Frida sure liked playing poor but she certainly didn't live like a communist! But I am excited about the cooking. After learning so much about Frida Kahlo, it was neat to read a book that was co-written by someone who actually knew her. It brings Frida to life. It was fascinating to read different stories about Frida Kahlo and browse through (and make!) some of the recipes! the story is OK but the photos are reason enough to get this book... beautiful! Who knew Frida was so incredible in the kitchen. If nothing else, this book is worth it's price for the Green Rice recipe on page 56. Frida's food recipes are wonderful. They bring back some lost Mexican traditions. If you are looking for authentic Mexican Recipes I highly recommend this book. A really nice Mexican cookbook with great pictures of food and Frida. By the daughter of Diego Rivera. After completing "The Lacuna" by Kingsolver (wonderful! ), I broke out "Frida's Fiestas," a book of recipes & reminicenses of life with Frida Kahlo. I feel a Mole Poblano coming on. This is a wonderful book. I can't wait to make (most) of the recipes! Haven't tried any of the recipes yet; but the book has some delightful stories of Frida and Diego, and beautiful photographs. Will update re: recipes. My favorite anniversary gift ever! Could read this several times for the photos alone. The recipes are quite traditional & the reminiscences are wonderful. Absolutely beautiful book... loved it! The photos gave me goosebumps. I look forward to cooking meals from this book! Excelentes recetas de toda la República Mexicana sazonadas con la historia de cada una. Excelente! My parents gave me this book for my birthday in 1994. Beautiful book! This is a beautiful book filled with art and recipes. I make all of my green sauce from the three recipes listed in this book. Amazing mexican recipes. Having cooked anything in the book yet. Great Mexican cookbook.